We welcome Steve Almond to Fictionaut and are pleased to feature his first published story at Line Breaks. Welcome to Fictionaut, Steve Almond. Steve is a total mensch (did I spell it right?) So happy to see him here! Loved the story, so crazy and affectionate at the same time. Heard Steve read at KGB long time ago, from “My Life in Heavy Metal” which is still one of my favorite story collections. 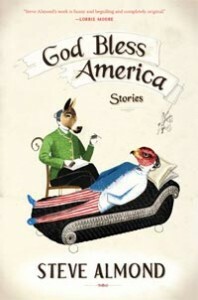 ps– can’t wait to read “God Bless America” which I’m sure will be a total trip! He’s going to be interviewed by Marc Maron on Maron’s podcast, “WTF,” on Thursday. That’s the best comedy/entertainment podcast in the business, at the moment. Can’t wait!